Have you ever been to a place and come out thinking holy cow where have you been all my life? Well this is that kind of place! Lickety Split is nestled at the back of Woking Town Centre on Chertsey Street. I stumbled across this little gem some time back, and whenever I am in the area it is definitely my go to. This is the perfect place for a wholesome breakfast and lunch on the go, and offers you something other than the usual farce of Boots or Supermarket etc. pre-packaged numbers. What makes this place stand out amongst the rest? For starters they are one of the few places that offer bagels. Plain, multigrain, seeded and jalapeño and cheese to name a few; with the choice of a list of accompanying toppings and fillings as long as your arm. They serve freshly made, traditional porridge however you like it, and your choices don’t stop there. You can also opt for panini’s, wraps, salad boxes, soups, jacket potatoes, with standard or special of the day fillings, and muffins. They even do catering! If your favourite item isn’t there, or something isn’t quite to your liking, they are more than happy to make it for you. Service is always with a smile, and almost every time I don’t even need to give my order because they already know what I am going to have (creature of habit when it comes to breakfast I’m afraid). Prices are very reasonable, there’s something to suit everyone. And if nothing else everything I and who I have been with has had, has declared it’s darn delicious! So this fine morning I opted for my usual brekkie option. 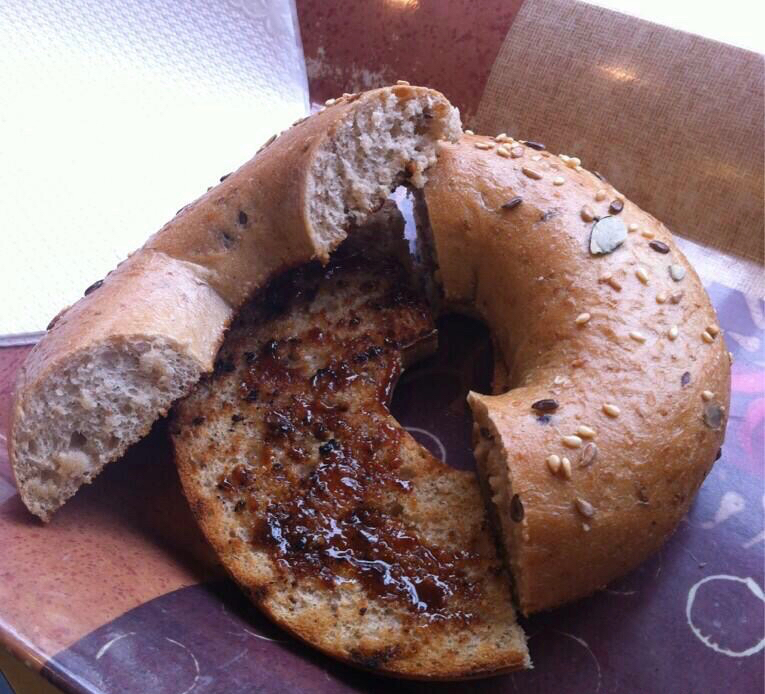 Multigrain bagel, little butter little Marmite, and a Vit Hit Boost Drink. 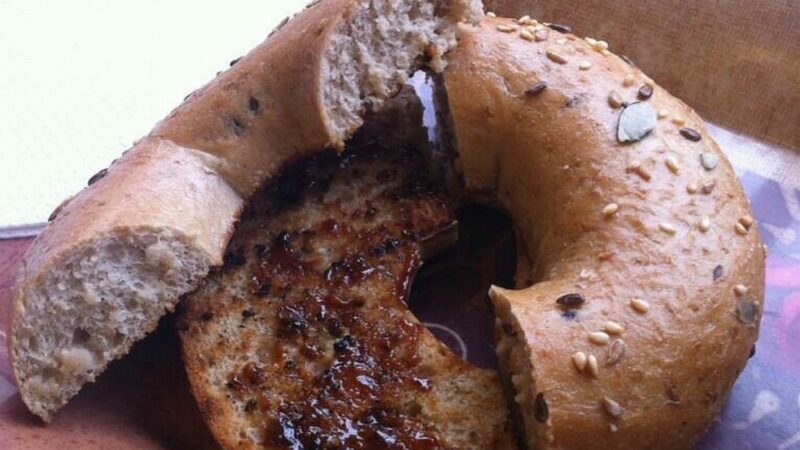 I don’t trust many places with Marmite, but they are the only ones that can get my bagel to butter to Marmite ratio spot on every time! And for some unknown reason their Marmite tastes so much better than when I have it at home! Simply put. Their bagels are the best I have had. Toasted to perfection, they’re fresh, thick, light and airy, whilst conforming to the traditional bagel of being chewy and dense. If you opt to eat in it’s even served to you on a little tray :o). The only real negative I can possibly think of is their peanut butter is Skippy peanut butter, which I’m not a fan of. If you are in the area this is a place you need to try. Bypass your usual trip to some outlet chain, put down your packaged sandwich, and treat yourself to Lickety Split. You really will not regret it! For more information especially about their catering, visit their website here and find their current Spring 2015 menu here. 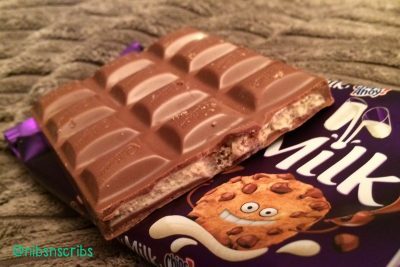 Previous Post Cadbury Dairy Milk Chips Ahoy!